In all honesty, I am torn about writing this blog post about Holbox Mexico. Part of me is desperate to share the simplicity and natural beauty we discovered on this idyllic island. The other part of me feels driven to protect this peaceful paradise. 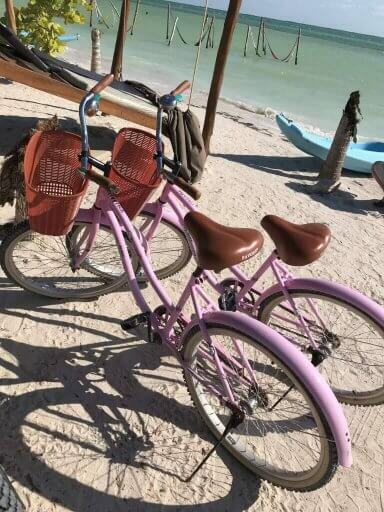 Driven to help preserve a way of life by locking our memories away and keeping Holbox hidden. However, we can’t apologise for stumbling across this island. Like many before us, this island has left an indelible footprint on our souls for many reasons. Love being the first. A marriage proposal under the starry night sky on the white coralline sand. 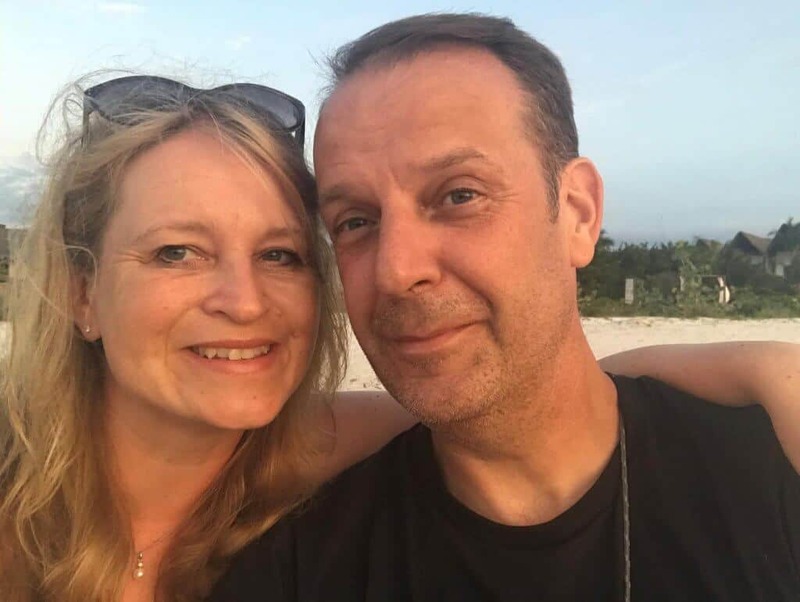 Beyond romance, Holbox is the perfect place to get Off the Tourist Treadmill and re-connect with nature, yourself and a simpler pace of life. This is the place for going off grid and spending time doing absolutely nothing. With some hesitation, we share our knowledge and experience of Holbox. If you visit in the future, we hope you will understand and respect the charm of this island and play your part in retaining its tranquil character. What else can I do on Holbox island? How can I get to Holbox island? Holbox is a small island, north of the Yucatan peninsula in the Gulf of Mexico. 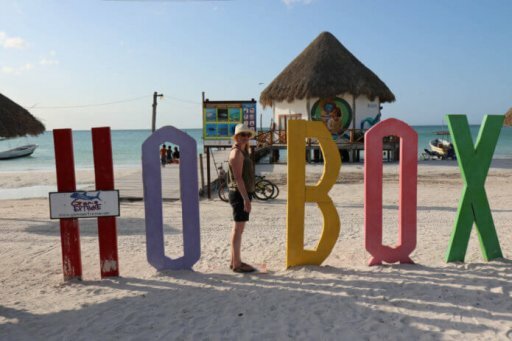 Also known as Isla Holbox, you pronounce it Hole-bosh not Hole-box. The island is only 26 miles (42 km) in length and about 1 mile wide and is separated from the coast of mainland Mexico by the Yalahau lagoon. Satellite images show that the lagoon has a deep rocky hole to the north-east of the island which makes the water appear black. Holbox is Mayan for ‘black hole’ and it is believed the dark lagoon water resulted in the island’s name. Situated at the meeting point of the Atlantic Ocean, Gulf of Mexico and the Caribbean Sea, the waters off Holbox are nutrient rich for marine life. For 5 months of the year, they are a migrating ground for whale sharks. The white coralline sand also provides nesting grounds for turtles, whilst dolphins and manta rays swim offshore. Holbox is also a sanctuary for over 500 species of birds. Flamingos wading in shallow lagoons at sunset and pelicans perched over the sea on silvery tree trunk remains are common sights. Indeed, as a result of the abundant marine life and wildlife, Holbox is protected as part of the Yum Balam Biosphere. Back in the 17th and 18th Century, Holbox island served as a different kind of shelter. A strategic safe-haven for pirates looking to replenish their fresh water supplies. For many years, the island’s natural fresh water source was the Yalahau Cenote found on a nearby island off the Mexican mainland to the west of Chiquila. Today, the quintessential charm of Holbox island is its natural beauty. Electricity didn’t arrive until 1987 and the island is still blissfully unspoilt by mass tourism. Instead, the appeal is no cars, no chain hotels, one ATM and weak Wifi signal. Shh! Let’s keep it this way and preserve this lifestyle for the island’s 2,000 full-time residents. If you are looking to unwind and appreciate the natural world, then this sleepy island is for you. Somehow this mellow island casts a spell on you as soon as you step onto its sandy streets. Invisibly, this island’s simple vibe spreads throughout your being. Without noticing, you become a hybrid beach-bum, and eco-lover. Cars and paved roads don’t exist here. Peaceful birdsong is only interrupted by the intermittent mechanical purr of taxi-buggies and golf carts. Even the ocean appears to fall under Holbox’s hypnotic spell. Gentle, crystal clear waters respectfully lap the white coral-sand beaches. Everything is peaceful here. Above all, Holbox is a tranquil retreat. A place to take time to enjoy your surroundings. Relax under palm trees. Run your hands through the sand. Gently swing on colourful hammocks skimming the smooth sea. If you can muster the energy, lazily cycle from one end of the island to the other. Stumble on nature reserves teeming with life or wade out to the sand bar and promenade along this natural pier. 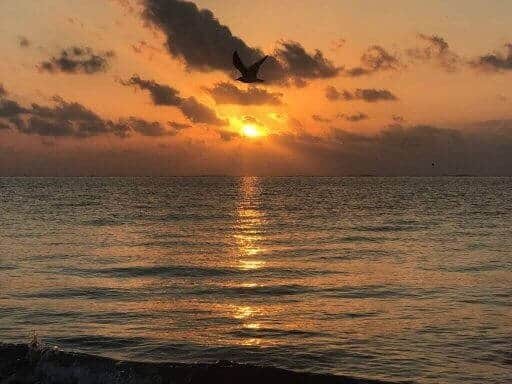 Sunset on Holbox island is a unifying reminder of the breath-taking beauty of our planet. Visitors casually huddle together on the beach or congregate with strangers on roof-top pool bars to witness this spectacular natural performance. Palm trees are boldly silhouetted against an ethereal glowing palette of pink, orange, yellow and gold. At the final curtain, the sun sinks majestically into the reflecting arms of the ocean. Vibrant colour is also a big feature of the small commercial hub of Holbox. Colourful buildings adorn the sandy streets. Stunning multi-coloured works of street art embellish every available blank wall, door and plank of wood to form an open-air art gallery. Fittingly, Holbox has earned the name of ‘graffiti island’ thanks to its regular involvement in the Annual International Public Art Festival (IPAF). Against this backdrop, the main square bursts into life after sunset. 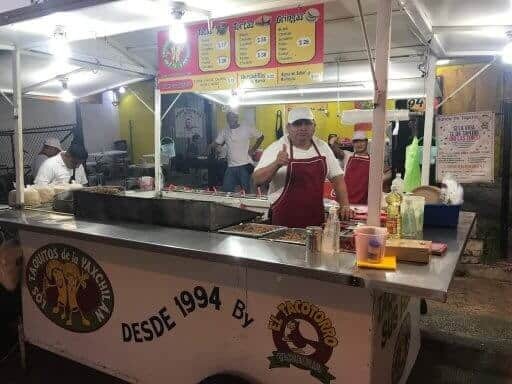 Locals and visitors mingle to enjoy the atmospheric street food stalls, restaurants and bars. Later, there’s time to browse the laid-back artisan boutiques and dance on the beach under the stars. Wherever you stay on Holbox, you will be within easy reach of the ocean. Swim in the clear waters with shoals of baby tarpon which occasionally catch you unawares by jumping out of the sea. Or, if you are feeling more adventurous, many of the hotels and sellers on the beach offer snorkelling and diving tours. From May to September, the ocean around Holbox becomes plankton-rich. You can take a private or shared boat and snorkel with whale sharks without the need to dive. 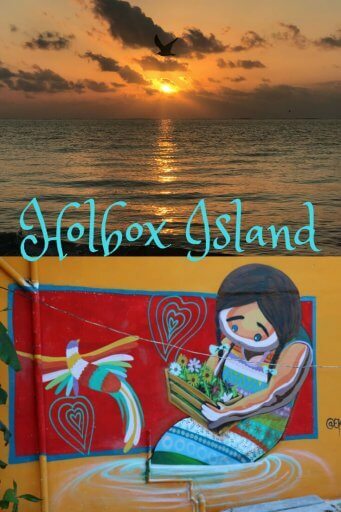 Three smaller islands can be reached by boat from Holbox island. 30 minutes’ away is the fresh water spring of Cenote Yalahau and Isla Pajaros (Bird Island). Swim in the Cenote Yalahau and discover whether the ancient legend is true. Apparently, the fresh water makes you 10 years’ younger. For many years, this Cenote was Holbox island’s largest source of fresh water and home to pirate, Francisco de Molas. Turn birdwatcher on Isla Pajaros. This bird island is a protected sanctuary for many species and allows you to see them in their natural habitat. From late April to October, Flamingos gather here. 15 minutes’ from Holbox by boat is Isla Passion which is a tropical paradise completely cut off from civilisation and noise. Finally, 45 minutes along the coast of Holbox is another island called Cabo Catoche. Here the Gulf of Mexico and Caribbean meet. There is a small reef where you can see many fish and coral. Perhaps you will be lucky enough to snorkel with dolphins, turtles and stingrays. Rent a bike or hire a golf-cart and head to the west side of the island called ‘Punta Coco’. On the way, explore deserted sandy side roads which lead to isolated treasures. Revive yourself from the heat with a cool drink on the swing seat of welcoming bars in the middle of nowhere. Be hypnotised by secluded beaches with hammocks idling in the sparkling sea. Explore the east of the island and you will find ‘Punta Mosquito’ with its impressive sandbar and abandoned beaches. Take time to stretch out alone on the white sands and marvel at the hide-away nature of this place. Although, golf-carts are banned at various points for ecological reasons, cycling along the sand in the heat is a serious calorie burner! Keep cycling east and you will discover tranquil estuaries teeming with fish and birds keeping watch on silvery perches in the sea. After that, if more exercise is your thing, Holbox island is a perfect playground for paddle-boarding, kayaking, wind-surfing and serious kite-surfing. The big surprise to many visitors is Holbox’s street art. The small centre of Holbox is literally alive with vibrant, multi-coloured panels created by national and international urban artists. Don’t miss the opportunity of aimlessly wandering around the streets. Enjoy this open-air display of raw vitality which has become an integral part of Holbox since 2014. This year marks Holbox’s first participation in the Annual International Public Art Festival (IPAF). More recently, the Revive Holbox Art Festival has led to a renewal of the murals. Resident artist, Ekza One (Daniel Illescas) has created many bold pieces with environmental messages. The enormous mural which covers the inside of the acoustic shell on the main square represents the creation of the island. His work colourfully reflects Mexican crafts and includes shapes and figures which carry messages of preservation of his country’s culture and society. Another of his pieces shows two horizontal girls linking hands in the shape of a snail symbolising united spirits in balance. Mexican urban artist Facte has also contributed to this dazzling display of art. His images of an old man and woman are so realistic that they feel photographic. Similarly, Columbian Lina Arias’ striking images of African faces are uncannily real. Much of the street art tells a story and reflects what Holbox means to the artists. The costliest option is to fly to Holbox island. Only day flights operate. Aerosaab offer private charter flights from Cancun, Playa del Carmen and Cozumel. One advantage of flying is that it provides you with the opportunity of visiting for just one day. But why would you? Even if you are pressed for time, we recommend that you stay longer to soak up the beauty and tranquillity of this location. 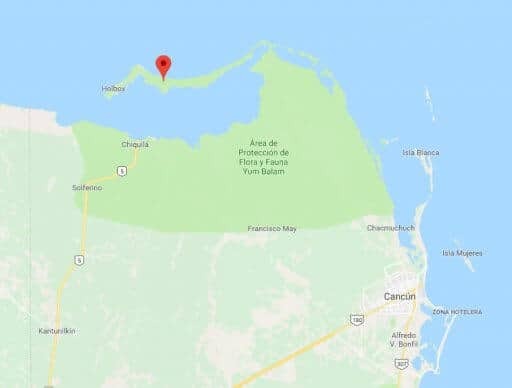 Basically, if you are heading to Holbox island by road, you need to end up in the small fishing port of Chiquila in the north of the Yucatan peninsula. 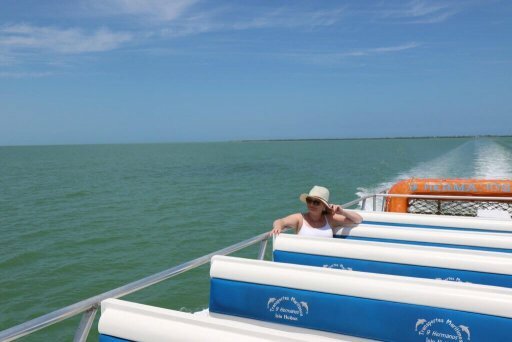 From here, you are obliged to take the ferry to Holbox. Road options to Chiquila include: bus, Colectivo, self-drive or private shuttle. Since we prefer to keep our costs down and mingle with the locals, our preferred option of travel was the bus. We took the 09.55 am ADO bus from Valladolid. The journey lasts about 2 hours and 20 minutes and the ticket currently costs 180 pesos (about £7). The ADO buses operate allocated seating and are air-conditioned with TV. The service is the comfortable, cheap and efficient. 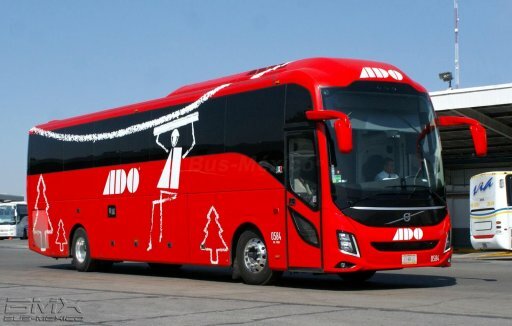 You can download the ADO app to your phone or check out their website for more information: here: https://www.ado.com.mx/#/ Other bus operators also run a service to and from Chiquila. We also saw Colectivos at Chiquila. 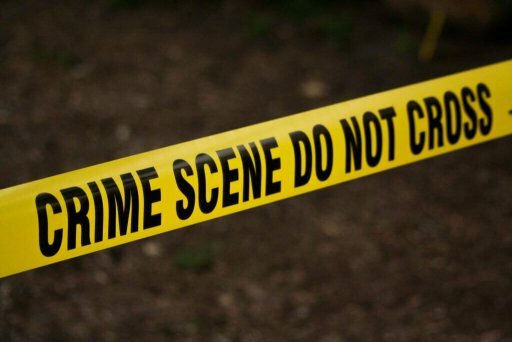 If you opt to self-drive, check the route before you travel. Some of the roads are toll roads. Also, be mindful that Holbox island is a no-car zone. You will need to pay to park your car at the port of Chiquila. There are two ferry providers which operate a service between Chiquila and Holbox: Holbox Express and 9 Hermanos. In our experience, there was no difference. Head to one of the ticket booths and you will be directed to buy a ticket for whichever ferry is leaving first. One ferry leaves every half an hour from Chiquila. The crossing costs about 100 pesos (about £4) per person and the journey lasts 20-30 minutes. Once you arrive at Holbox, collect your luggage and follow everyone else along the jetty. Here you will be greeted by a rank of Holcar yellow taxis which are golf-carts! They are inexpensive and will transport you from the ferry dock to your choice of accommodation unless you prefer walking. 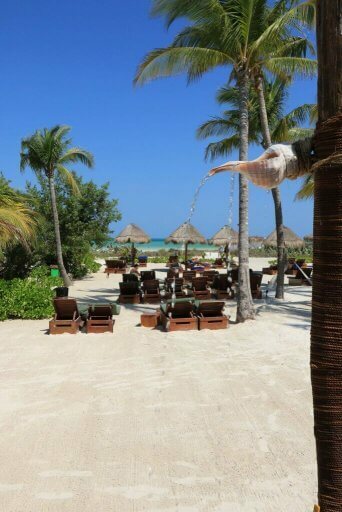 Click here for our step by step guide on how to go to Holbox Island. Staying in Holbox is not cheap and accommodation varies in price, but there is plenty of choice. There are many boutique hotels nestled along the beach front, but you won’t find any chain hotels. Try Airbnb for less expensive options. 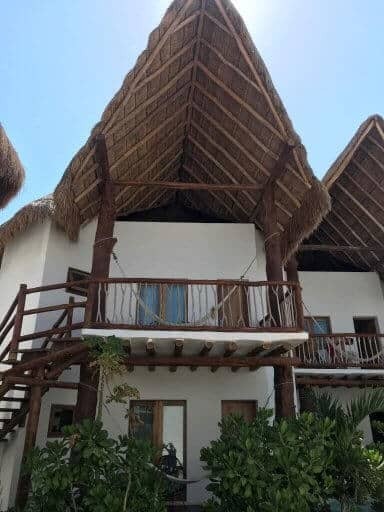 Much of the accommodation is built in a traditional ‘palapa’-style. Traditionally these are open-sided dwellings with thatched roofs made of palm leaves. Palapas are also common on Mexican beaches as they provide shade in hot weather. Our first choice of accommodation was a beach front hotel called the ‘Villas HM Palapas del Mar’. Rooms were situated in two-storey white-washed palapa-style round structures. Our comfortable room was on the top floor with wooden balcony, hammock and sea view. The hotel had two beautiful swimming pools. One was on the roof which was a perfect spot to watch the spectacular sunsets with a Margarita! The hotel’s small private beach had sunbeds and hammocks, but shade was difficult to find. 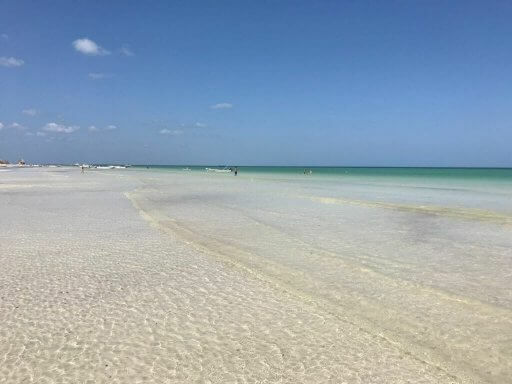 Holbox beach is right across the sandy street. Villas HM Palapas del Mar had a couples feel to it, although some families were staying here. After a few nights here, we headed to the sister hotel next door: ‘Villas HM Paraiso del Mar’. Again, this is a beach front hotel. In contrast to our previous hotel, the grounds were full of tropical vegetation and there was plenty of shade on the private beach. This hotel had more of a family feel and the attractive pool was busy at times. However, the private beach was tranquil and seconds from the ocean. Rooms were found in a similar style of round dwellings, but these had a more rustic feel, and some were three-storeys high. As a result, it felt like we were staying in a traditional village nestled on the beach. Holbox island is a hidden Mexican treasure and should be preserved as one of the unspoilt corners of our planet. In the words of David Attenborough, let’s cherish the natural world because we are part of it and we depend on it. My sincere wish is that this place remains a sanctuary to its natural residents and that its human residents resist further development. 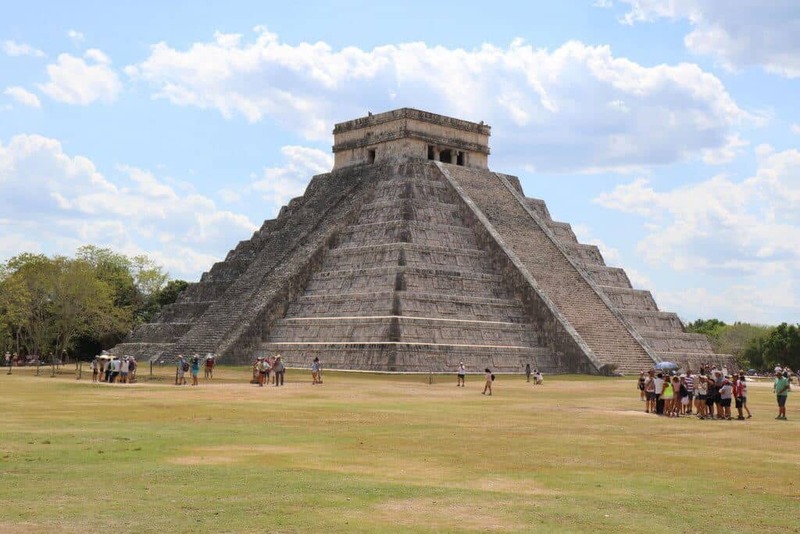 Click here to read our article about backpacking around theYucatan Peninsula.